Perception of beauty is constantly changing and circulating, depending on the historical period, local affinities and global trends. However, based on common sense, and also a vast number of definitions (some of which can even be found in the online dictionaries), beauty is almost without an exception defined as a quality that gives not only pleasure for the sense, but also for the mind. 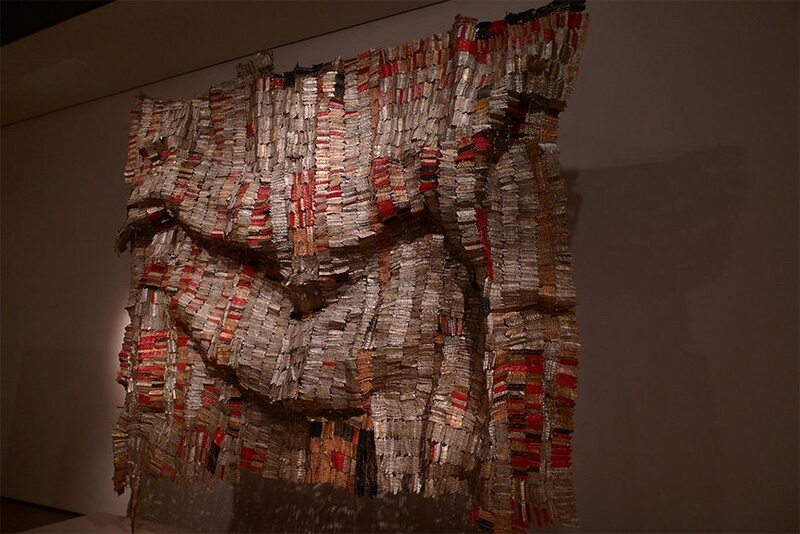 Therefore, to say that El Anatsui’s works are beautiful is more than appropriate. His authentic large-scale assemblages give us something very pleasing and particularly attractive to look at, but also suggest that the elements they are made of are definitely not random. 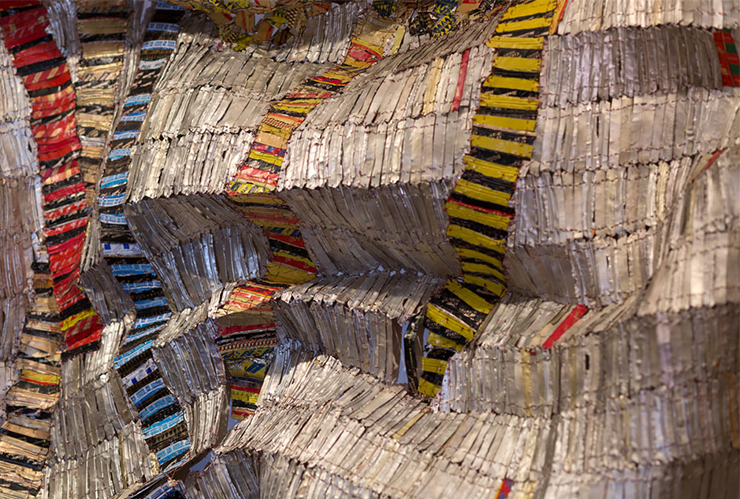 El Anatsui poses questions about consumption and waste. He therefore often uses traditional materials, such as wood, and clay, but works with them in unusual ways. He is known for cutting wood with chainsaws, for example, which sounds awkwardly aggressive, but in fact turns out as a completely opposite category, as the term aggressive is something that is highly unlikely to be used to describe Anatsui’s work. Some of his works resemble woven cloths, and they sometimes include some of the traditional Ghanaian motifs embedded within. In recent years, he gained recognition for his bottle-top installations, which consist of thousands of aluminium bottle tops, wired together with copper. 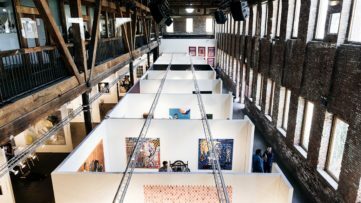 October Gallery has prepared a selection of new works by the renowned artist. 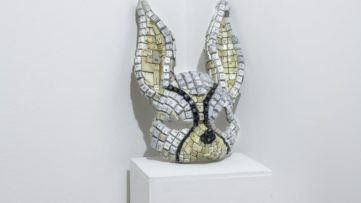 The show promises to explore the possibilities of the famous bottle-top assemblages further, and to refer to the topics that the artist is usually concerned with once again. 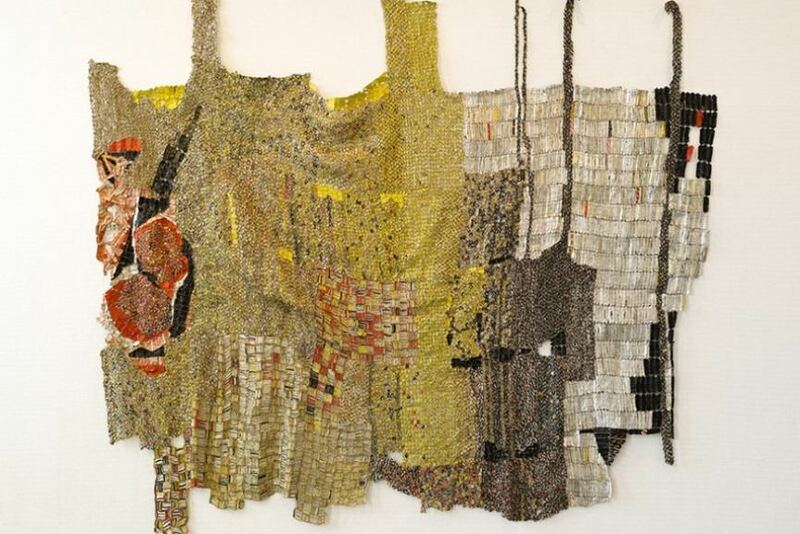 In an interview with the gallery, El Anatsui explained: “The amazing thing about working with these metallic ‘fabrics’ is that the poverty of the materials used in no way precludes the telling of rich and wonderful stories”. The emphasis is put on the special value that these ordinary, wasteful items can have, one which can probably be found only by someone who understands parts of their nature, as an artist, and not as a consumer. 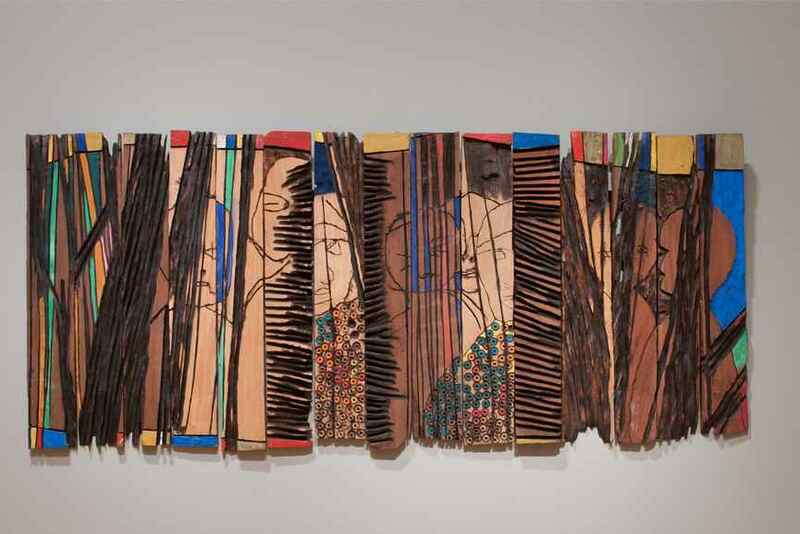 El Anatsui: New Works will be on view from February 4 until April 2, 2016 at October Gallery in London. El Anatsui – Strained Roots (detail), 2014.Aluminium and copper wire, size variable. 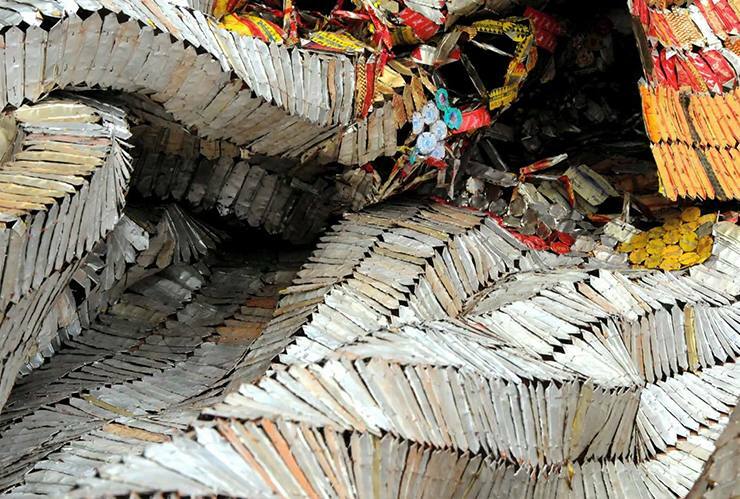 El Anatsui – Process of making. Filmed at his Nsukka, Nigeria studio in 2011. 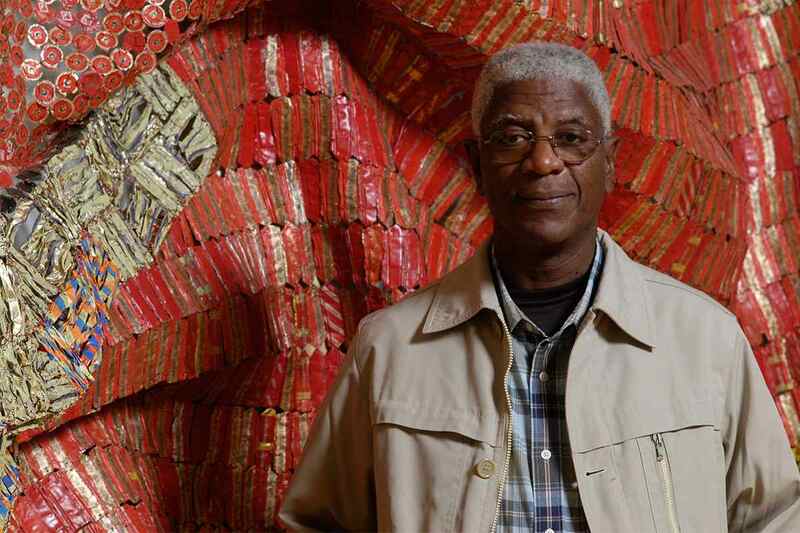 Featured images: Portrait of El Anatsui. Courtesy of October Gallery. 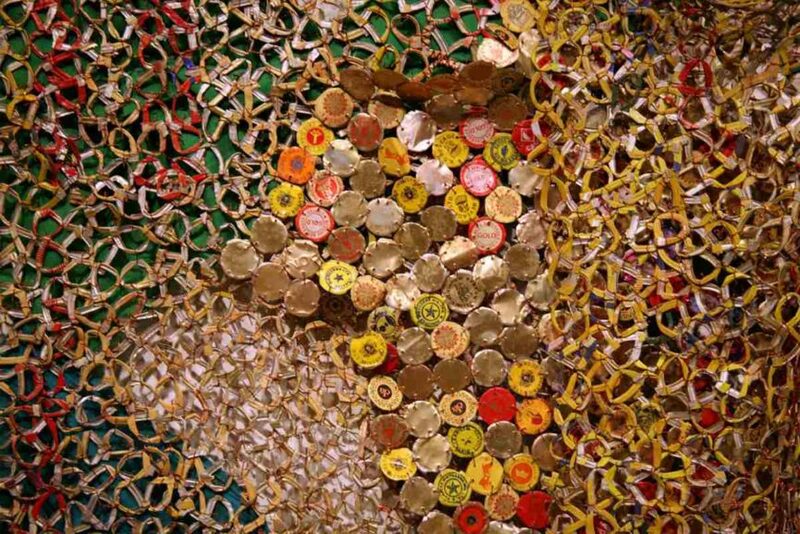 Photo by Andy Keate; El Anatsui Nukae; El Anatsui -Conspirators, 1997. Wooden relief with paint(61 x 141.6 x 2.2 cm). Courtesy of the artist and Jack Shainman Gallery, New York. 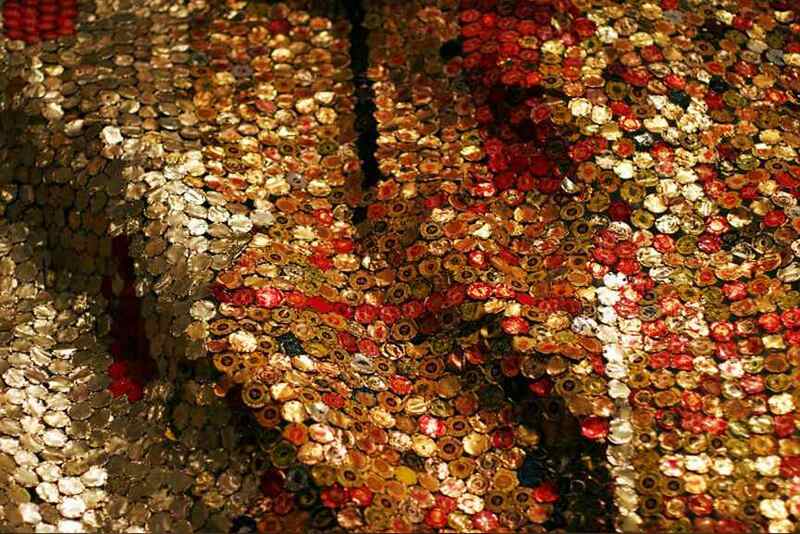 Photograph by Andrew McAllister, courtesy of the Akron Art Museum; El Anatsui – Straying Continents; Man’s Cloth by El Anatsui (1998 – 2001), on display at the British Museum; El Anatsui Dzi II, detail, 2015. Aluminium and copper. Photo Tobias Nordvik © Kunstbanken Norway, courtesy October Gallery London.